Roughly chop the tomatoes and place in a saucepan with the olive oil, garlic, lemon zest and oregano. Bring to the boil, cover, simmer gently for 30 minutes. Add the basil, salt and pepper to taste and simmer uncovered, for a further 20-30 minutes until the sauce is thickened. 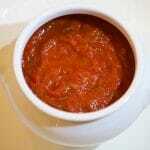 Pass through a sieve if a smoother sauce is preferred.